Euro NCAP AEB Car-to-car 2018 (VUT) – this includes post processing for the brake characterisation and the main tests, giving the user instant feedback on the validity of the test as well as speed reduction and collision status. Euro NCAP AEB Car-to-car 2018 (GVT) – this is designed to be used with the AB Dynamics Guided Soft Target (GST) which is ideal for this kind of testing. Euro NCAP AEB Car-to-VRU 2018 (VUT). Euro NCAP AEB Car-to-VRU 2018 (VRU) – designed specifically for use with AB Dynamics Soft Pedestrian Target (SPT), this has tests for a pedestrian and a bicyclist as well as for longitudinal and crossing scenarios. 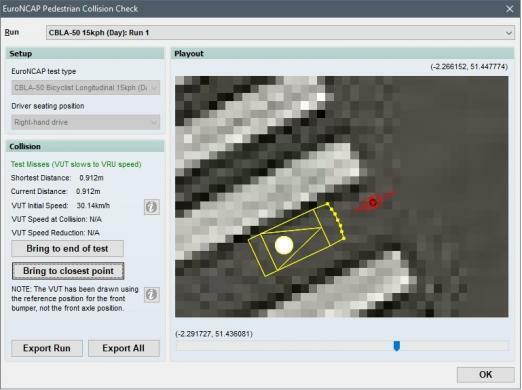 It also includes a comprehensive post processing tool for collision checking, considering the seven-point front bumper of the Vehicle Under Test (VUT).